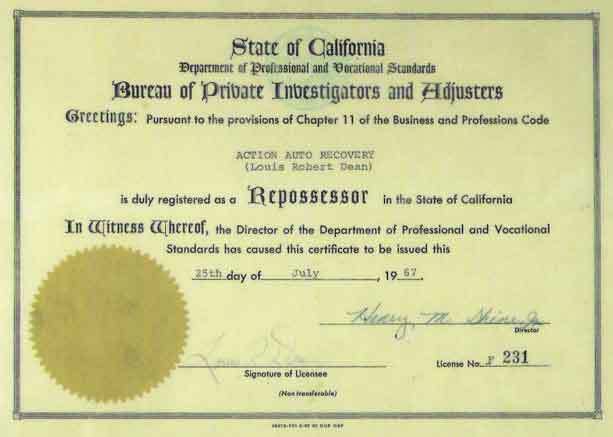 Action Auto Recovery’s Repossessors are employees and not independent contractors. They are covered under our workers compensation insurance. Actions "A" rated insurance policy covers business liability, Garage keeper’s direct and primary coverage for wrongful repossession, personal injury and auto liability, with one of the top rated insurance companies in our industry. As a Member of the Allied Finance Adjusters our clients are covered under their client $1,000,000 Fidelity Policy. Click the AFA Logo below to view our goodies! Due to the death of Louis R. Dean in 2011 the founder of Action Auto Recovery. Our licenses number changed again from RA 641 to RA 1798 in July of 2017. Enter our new licenses number "1798"